I was doing some testing on a 3750X and saw that the http and http services were enabled. I knew that you could apply an ACL to restrict HTTP access, but had assumed that the HTTP security was an optional extra on top of the VTY ACL. I tested this … and found out I was wrong. 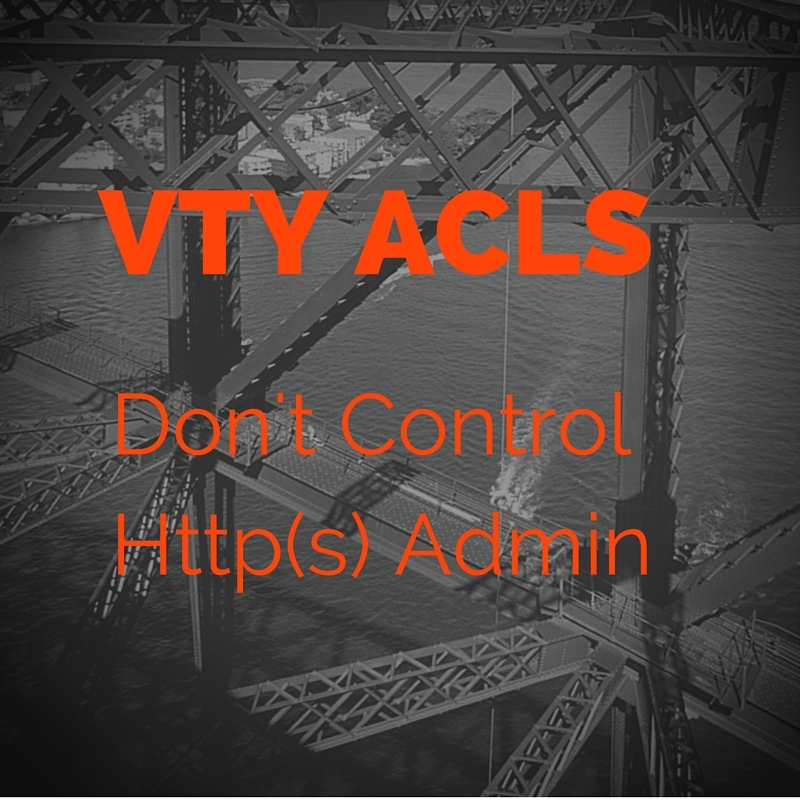 Although http(s) uses the same inband access path as SSH, web admin is not restricted in any way by VTY ACLS. This will be quite obvious to some readers but it wasn’t for me, so I’ll assume at least one other person on the interwebz had the same issue. Let’s start with a baseline. 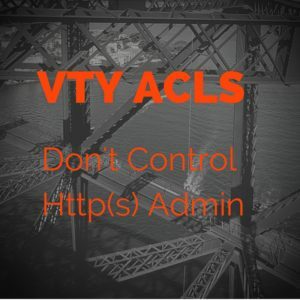 https and http secure are configured, and no VTY ACL is applied. A quick public safety announcement I’m consoled into a non-production switch. I’m testing here from another directly attached switch. Trying 192.168.0.1, 80 ... Open  !! Whaaa? Switch_2#ssh -l admin 192.168.0.1 % Connection refused by remote host !! SSH is now blocked Switch_2#telnet 192.168.0.1 80 Trying 192.168.0.1, 80 ... Open !! Whaaa? ….or you follow your instinct and blow away web access. And all is right with the world. I’d go back and adjust deny all VTY ACL though. Http and Https are secured independently of the VTY access-list. If you see http or https services in your config but don’t ‘http access-class’ you should be concerned. Immediately move past the worry stage – lock down web admin access to http and https with access-lists or remove http admin completely. I really hope that IPv6 is not in use. The “ip http access-class” only matches ipv4 traffic. There is nothing similar for IPv6. The only way to block unwanted ipv6 http traffic to the device is with interface acls.